Hélène Gorge, Nil Özçaglar-Toulouse, and Stéphanie Toussaint. Paper published in Recherche et Applications Marketing (2015). Book edited in 2012 by Lisa Penaloza, Nil Özçağlar-Toulouse and Luca Massimiliano Visconti. Culture pervades consumption and marketing activity in ways that potentially benefit marketing managers. 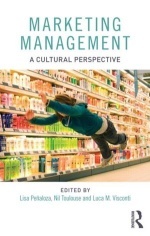 This book provides a comprehensive account of cultural knowledge and skills useful in strategic marketing management.